Point2 Homes gives you far more than a simple list of condos for sale. 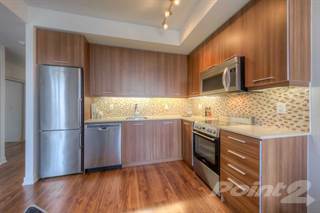 Get instant access to a lot of relevant information about Toronto, ON condos, including property descriptions, virtual tours, maps and photos. Many of the search results pages also have a wealth of information on Toronto, ON, right below the listings displayed. You get many filter functions on Point2 Homes to help narrow down your search. You can use Toronto, ON condo prices, square footage, amenities and many other characteristics. Another useful way of filtering listings is the Price Drop feature, which shows you apartments and condos for sale which have had price drops in the past six months, so you’ll never miss a bargain. Use the map view to find Toronto, ON condos and apartments for sale, based on what amenities or city features you may want close by. You can close in on a specific neighbourhood or area by simply drawing around it with the polygon or radius tools. Stay informed about the latest entries on the real estate market by saving your searches. This way, you get new listings in your inbox, daily or every week, based on your preferences. If you’d like to get in touch with a professional, agents are displayed next to their listings, and they’re easy to contact through the online forms. If you want more options, you can go to the Tools tab, click on Find an Agent, and you’ll get a list of helpful and knowledgeable real estate agents in Toronto, ON. Visit the Point2 Homes blog and you can find up to date expert advice on many markets throughout Canada, regular market reports, neighbourhood scoops in cities throughout the provinces, real estate deals and useful recommendations. With a population of close to 3 million people, Toronto is the largest city in Canada (based on population). It is also the capital city of the province of Ontario. Located near the communities of Mississauga, Brampton, Vaughan, and Ajax, the city sits in the southwestern corner of the province on the coast of Lake Ontario. Toronto has over 630 square kilometres of residential, commercial, natural, and industrial areas and has a rich history. Almost 50% of the city’s population belongs to visible minority groups, making for an interesting multicultural community. Toronto’s housing prices are on the high side, with average costs ranging from $550,000 to $850,000. The city’s western and central sections have many high-rise residential buildings, as well as more expensive single-family homes (detached and row houses). Commercial spaces tend to be retail-based, and there are some vacant lots. A mix of single-family homes, high-rise and low-rise multi-family units, and row houses are offered in the southern section, as are office and retail spaces. Most of Toronto’s condo options are located in the city’s downtown, along Lake Ontario. 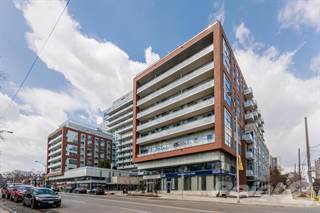 The College Condominium at Spadina was completed by Tribute Communities in 2016 and has 226 units in its 15 stories. 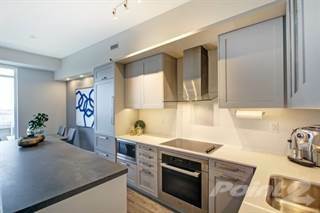 The building is in the highly desirable neighbourhood of Kensington Market and features amenities such as an exercise room, a theatre room, a guest suite, concierge service, and a terrace. Unit prices range from $590,000 to $810,000. Currently under construction is Ten York by Tridel, a luxury building that will be 65 stories high and will have 725 units ranging in price from $1,500,000 to $3,200,000. Overlooking Lake Ontario, the building will include features such as a spa, guest suites, a theatre room, a pool, an exercise room, and concierge service. North Toronto and Yonge & Eglinton are two neighbourhoods that have also seen recent condo development. Whitehaus Condos, a joint project by Lifetime Developments and Knightstone Capital Management Inc., is in the preconstruction phase, with units priced between $680,000 and $920,000. When complete, the building will be 29 stories with 358 units, and will include an artist studio, a dog wash station, a lounge and bar, and a fitness centre. 101 Erskine by Tridel is currently being built and the building’s 420 units will range in price from $530,000 to $1,700,000. It is located close to public transportation and other conveniences, and will be 32 storeys once complete. Business and finance are big industries in Toronto, and the city has a financial district that is home to many banks and brokerage firms. The five largest financial institutions in the country, which include CIBC, BMO, TD, RBC, and Scotiabank, all have national offices in the city. Also, Toronto is home to the seventh-largest stock exchange in the world (the Toronto Stock Exchange). Other major industries in the city include TV and film production, publishing, information technology, manufacturing (mostly a distribution point), media, and telecommunications. The city’s unemployment rate tends to sit around 6% to 7%, which is similar to the national rate. The Toronto Transit System operates public transportation in the city, which includes buses (over 1,800), rapid transit (over 750), and streetcars (over 250). There are close to 150 bus routes in Toronto that provide transportation to over a million people each day. The city’s subway system (rapid transit) has four lines: Line 1 Yonge-University, Line 2 Bloor-Danforth, Line 3 Scarborough, and Line 4 Sheppard. A fifth line (Line 5 Eglinton) is expected to open in the next several years. The streetcar network is found mostly in downtown Toronto and has 11 lines. Other transportation in the city includes Greyhound (long-distance bus) and the Toronto Pearson International Airport. Since Toronto is such a large city, the Toronto District School Board operates over 550 schools (primary and secondary). The city also has the Toronto Catholic District School Board, the Conseil scolaire de district du Centre-Sud-Ouest, and the Conseil scolaire de district catholique Centre-Sud. Private schools are operated independently and include university preparatory schools. The Royal Ontario Museum is the largest museum in Canada and features 40 galleries of cultural and natural artifacts and displays such as dinosaurs, Canadian history, fine arts, minerals, European history, and space. More than a million visitors make their way through the museum each year. The CN Tower is an iconic building in Toronto that was erected in 1976. At the time, it was the world’s tallest tower at 1,815.3 feet. The building features six glass-fronted elevators, a level with a glass floor (1,122 feet up), a LookOut Level (1,136 feet up), and a SkyPod level (1,465 feet up), which are all open to the public.